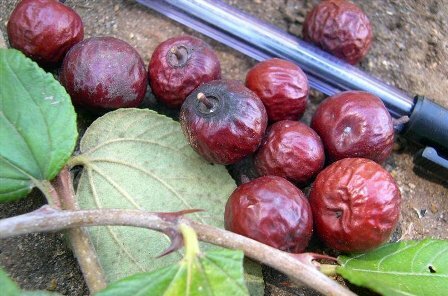 « Boroi_Ziziphus mauritiana » BER (Indian)_Zizyphus spp. Common names: umPhafa, umLahlankosi, isiLahla), umPhafa, umLahlabantu, mokgalo, mutshetshete, mphasamhala, mokgalô, moonaona. Wag-‘n-bietjie tree represents life as we know it. The young twigs are zigzag, indicating that life is not always straightforward. Two thorns at the nodes are also significant; one facing backward represents where we come from and one facing forward, represents where we are going. This plant is distributed throughout the summer rainfall areas of sub-Saharan Africa, extending from South Africa northwards to Ethiopia and Arabia. 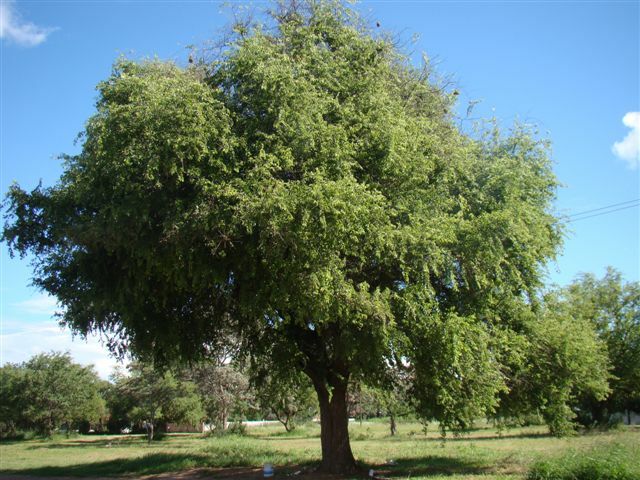 Wag-‘n-bietjie tree is a small to medium-sized tree, 3–10(–20) m high; with a spreading canopy. The main stem is green and hairy when young; year old branches often zigzag; the bark is reddish brown or roughly mottled grey, cracked into small rectangular blocks, revealing a red and stringy under-surface. Young stems are reddish brown. 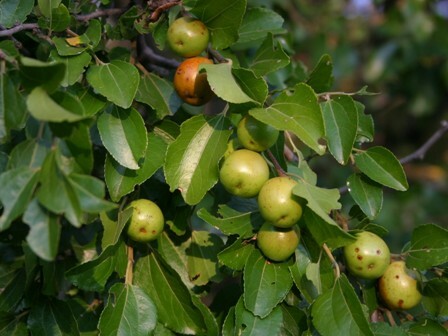 Leaves are simple, alternate; ovate or broadly ovate; vary enormously in size from tree to tree, 30–90 x 20–50 mm, tapering or often mucronate apex, base strongly asymmetrical, cordate to rounded on one side; margin finely serrated, often badly eaten by insects, glossy green above, slightly hairy and paler below; 3- to 5-veined from the base; veins covered with fine hairs when young; petiole up to 20 mm long; stipules, when present, take the form of small thorns at the nodes, one straight and one hooked. Leaves turn golden yellow in autumn. 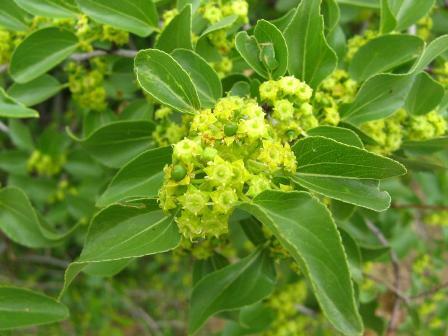 Flowers are borne in dense clusters in leaf axils; green to yellow; ± 4mm in diameter; inconspicuous (October–February). The fruit is a smooth, shiny, leathery, spherical drupe, 12–20 mm in diameter, reddish-brown or deep red when ripe, slightly sweet, the pulp is dry. The fruit sometimes stays on the plant long after the leaves have fallen (March–August). The seeds are usually solitary, elliptic and compressed. A decoction of the glutinous roots is commonly administered as a painkiller for all sorts of pains as well as dysentery. A concoction of the bark and the leaves is used for respiratory ailments and other septic swellings of the skin. Pastes of the root and leaves can be applied to treat boils, swollen glands, wounds and sores. Steam baths from the bark are used to purify and improve the complexion. In East Africa, roots are used for treating snake bites. All of the above can be attributed to the peptide alkaloids and antifungal properties isolated from the bark and leaves.
. Africans have many beliefs and superstitions attached to this tree. Zulus and Swazis use the buffalo thorn in connection with burial rites. It was once customary that when a Zulu chief died, the tree was planted on his grave as a reminder or symbol of where the chief lies. Hence the name umLahlankosi— that which buries the chief. A twig from the tree was and is still used to attract and carry the spirit of the deceased from the place of death to the new resting place. When a stock owner died, and was buried according to custom, within the cattle or goat kraal, some branches were placed on the grave so that the animals nibbled on leaves and twigs, and so understood that their master had died. In other parts, Africans drag a branch round the village to protect it from evil spirits, as it is believed to keep evil spirits away. In Botswana as well as most parts of South Africa, the residents believed the buffalo thorn to be immune against lightning, anyone standing under one in a storm would be safe. It is also believed that if it is felled in summer, a drought, hail or lightning will certainly follow. Wood from this tree is used for timber; wagon making and fence posts as it yields a yellow, fine-grained, heavy wood which contains 12.2–15.7% tanning matter. The elasticity of the shoots makes it suitable for bows and whip sticks. Some African tribes use the thorny branches to make kraals or hedges. This protects their livestock from lions and other predators. The species is very easily raised from seed or cuttings, growing in just about any soil type and withstanding heat and cold equally well. The seed however has poor keeping properties and should be sown fresh. After cleaning the nut, it can be placed between the jaws of a vice or a normal nutcracker and closed gradually until the nut cracks and seed is released. The seeds can then be covered with hot water, allowed to cool, soaked for two days and sown. Seedlings should appear within one to two weeks. Seedlings and small plants need moderate water, full sun and efficient drainage or they will damp off. Even though this plant is said to be one of the most adaptable trees, growing in all types of soil and having the ability to withstand intense heat, cold and drought, the same cannot be said for the seedlings. As with most plants, immunity is acquired with increased stature. Small trees are often available at nurseries selling indigenous plants. While slow-growing (0.3 m or less per annum), it makes a pleasant shade tree and gives life to the garden by luring birds and insects such as butterflies, beetles and bees.